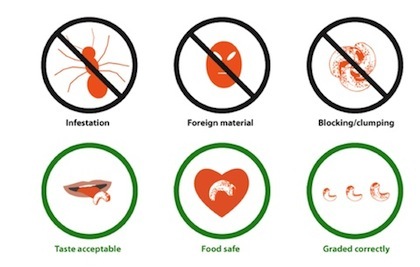 The ACA Quality & Sustainability Seal is an industry-accepted mark that confirms compliance with internationally-recognized standards of quality, food safety and social and labor standards. The Seal was developed with the input of a former US Food and Drug Administration (FDA) officer to ensure its compliance with the requirements of the US Food Safety Modernization Act. 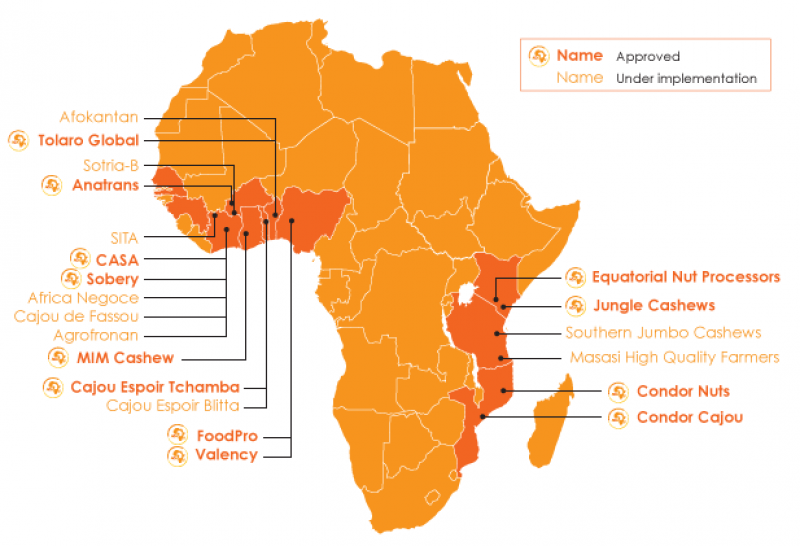 Since its inception in 2012, the Seal has so far been granted to 8 African processors, while food industry giants Kraft Foods and Intersnack have committed to buying Seal-approved cashew. To receive the Seal, a processor must demonstrate that they have systems in place to ensure all their processes measure up to the ACA Seal Benchmarks. 14 specific food safety/quality areas, including infestation, foreign material, clumping/blocking, taste, and grade compliance. Global social compliance standards: absence of child/prison labor, absence of abuse or harassment, and fair employee wages, as well as local labour laws. 1. Why should processors become ACA Seal-approved? Implementation of ACA Seal procedures (a proven set of practical turn-key programs) typically results in significant cost savings for processors. Assuming a company processes 2,000MT of cashew nuts per year, the ACA Seal can result in more than US$0.042 in cost savings per pound of kernel produced. Even after implementation fees, it is projected that the Seal program will generate a net additional profit of more than US$0.03 per pound. avoidance of charge-backs due to product damages, cost of treating infestation etc. The ACA Seal signals high quality cashew to the entire industry, enabling processors to enter new markets and attract major customers. As processing continues to rapidly grow in Africa, the Seal will play an increasingly important role in the relationship between African processors and international buyers. The levels of support the ACA has been able to mobilize for the Seal in its early years (e.g. from Kraft Foods and Intersnack) make clear that now is the best time to get started! 2. Why should buyers purchase ACA Seal cashew? The ACA Seal is synonymous with high quality cashew. ACA Seal cashew is produced in facilities that meet the highest international standards for food safety and social/labor standards. The Seal program examines all systems in place at processing facilities to ensure continuous quality control, rather than relying on random product inspections only. The ACA Seal is also compliant with the US Food Safety Modernization Act and all other regulatory standards. By selecting an ACA Seal-approved supplier, buyers minimize the risk of losing money or suffering costly supply disruptions of the sort caused by shipments full of infestation or foreign material, or other common quality complaints. Buying ACA seal cashew means less worrying about the risk of charge-backs and claims. Any concerns or follow-up requests will be addressed by ACA on the ground in Africa. The ACA Seal program is administered by experts who are experienced in cashew processing and are familiar with the specifics of the industry. 3. How can I buy Cashew from ACA Seal-Approved Processors? Please contact the ACA at aca @ africancashewalliance.com for more information about how you can begin buying ACA Seal cashew! 4. As a processor in Africa, how can I get started with the ACA Quality and Sustainability Seal Program? Please contact the ACA Seal Coordinator, Dorcas Amoh, at damoh @ africancashewalliance.com for more information about how you can begin improving your processing facility! ACA Quality and Sustainability Seal services are made possible by the generous support of the American people through the United States Agency for International Development (USAID).